Home › Uncategorized › Another Halloween, another WIN! Another halloween, another “best group” costume win. 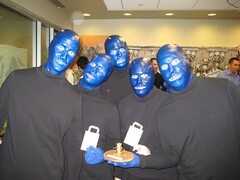 Our carpool went as the blue man group, and jeff (and jay) also built a “Drum-bone” that we played a little routine on. Somehow through all the pictures/etc at work, i don’t think anyone got a video of us! There are a bunch of pictures of prep and other halloween stuff (some that might be NSFW!) in this flickr set! And yes, i know i’m posting this like a month late! I’m catching up on blogging tonight, since there is nothing on TV. Halloween this year, not like the others. ‹ The whole world is against us?